Diamond Swim Academy believe water safety to be a key factor in our lessons. Each term our swimmers will have a water safety week where they will practice potentially lifesaving techniques. Diamond Swim Academy deliver the Rookie Lifeguard Programme which is a RLSS programme. They are the leaders in the UK for Lifesaving. 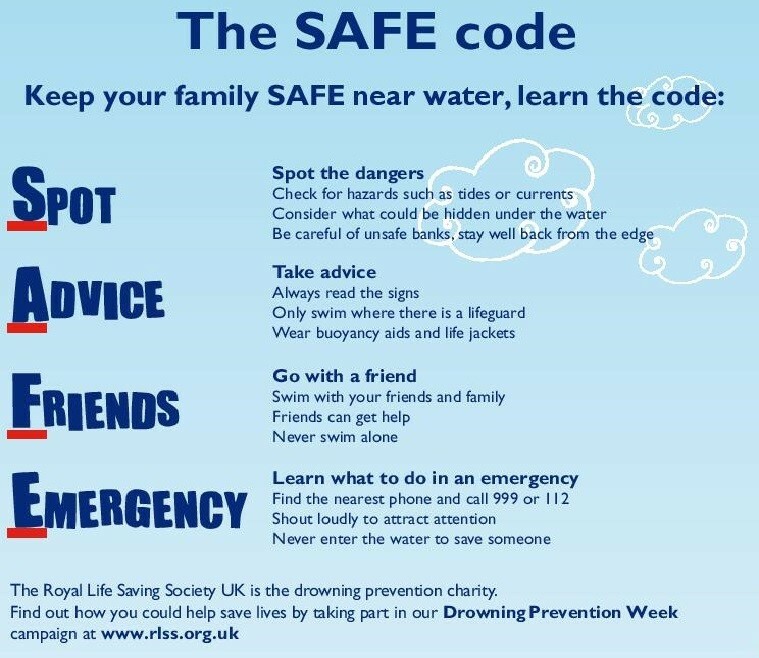 The below is advice they have given to stay safe around different scenarios and areas of water. Putting this into context, one person dies every 20 hours in the UK. Drowning is also the third highest cause of accidental death of children in the UK. Did you know that people can drown in as little as 2cm of water? The number of drownings that occur around the home are low compared to those at other locations. However, drownings around the home are also the most easily preventable. Each year UK citizens drown on holiday abroad so being aware of the basic principles of water safety on holiday, combined with knowledge and understanding of the hazards, can increase enjoyment and significantly reduce the number of deaths each year. People preparing for their summer holidays should ensure simple advice is followed by all members of the family. In the UK tides are relatively regular and predictable, yet despite this fact every year a number of people are caught out by rapidly rising water and end up being trapped in isolated bays. If you intend to venture across any beach or bank affected by tidal water make sure you know when the incoming tide is expected and know where all the exits are. It must be remembered that beach flag systems are different across the world. However, current discussions are taking place to hopefully co-ordinate the flags for the future. On average, more than 400 people drown in the UK each year. Nearly 60 of these are children and young people. We believe that the majority of drownings are preventable through good knowledge of water safety in swimming pools. Make sure that you and your loved-ones are not counted in next year’s drowning figures. More UK children die in pools while abroad on holiday than in pools in the UK. Make sure you and others are safe in swimming pools in the UK and abroad. More than 12% of the UK population live in areas at risk of flooding from rivers or the sea which can cause drowning. However, through flood safety education and knowing what to do before, during and after flooding, many of these drownings are preventable. Whether there are swollen rivers or general floodwater on roads and pathways, it is vital people follow simple, common sense, steps during periods of flooding to help ensure they, and their families, stay safe. It is often tempting to take a look at rivers at their peak but this can be dangerous, and drivers may take risks driving through floodwater, unaware of levels of depth. It is vital not to underestimate the power of floodwater. Around 85% of accidental drownings occur at open water sites. Many of these drownings occur due to a lack of knowledge and understanding of open water safety. The basic principles of open water safety, combined with knowledge and understanding of the hazards, can increase enjoyment of open water and significantly reduce the number of incidents that occur each year. Open water swimming takes place in outdoor bodies of water such as, lakes, rivers, canals, reservoirs and quarries. Flat or still water is defined as water that has minimal movement, except for locally induced wind currents. Examples include lakes, lochs, ponds, quarry pool and reservoirs. Flat water found in lakes and lochs is the safest open water natural environment. However, water is by its very nature hazardous and care must always be taken when being near water margins. Lakes and Lochs can vary considerably in size, but they are commonly large expanses of deep, cold water, formed when natural basins fill with water flowing from rivers and streams or from the water table. Did you know that those that walk or run near water are at potential risk, as this group accounts for the largest proportion of UK drownings. The effects of cold water shock are responsible for many of the drownings which occur in the UK every year, as the water temperature in the UK never gets warm enough. Cold water shock affects our ability to swim and self-rescue. Immediately after immersion in cold water, rapid cooling of the skin causes a number of instinctive and reactions including gasping, hyperventilation, restriction of blood flows, and panic. Following the cold shock response, the hands, feet, arms and legs start to cool and blood flow continues to be restricted. This causes a decrease in muscle strength and endurance leading to muscle fatigue and reduced control over body movements. If the casualty is unable to get out of the water or use a buoyancy aid, this will ultimately result in drowning. Over time, significant heat lost causes the core body temperature to drop leading to hypothermia. Flooded wellington boots or waders make it very difficult to move and can be a significant hazard. Do you need to wear them? Be aware of local water hazards such as weirs, strong currents, slippery or undercut banks etc. 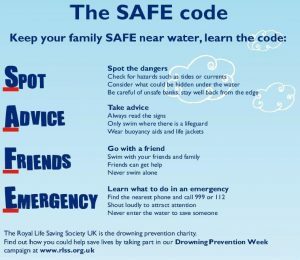 Dr Cliff Nelson, RLSS UK’s Head of Water Safety Management, said: “People often don’t realise the dangers that rivers and open water pose. We want people to enjoy themselves, but look out for their safety and the safety of others when around water. “When angling you should always ensure that you wear a buoyancy aid if you can’t swim, be trained in CPR and have a throw line on hand which you know how to use. These simple changes could help prevent drowning and keep you and others safe. Around 400 people drown in the UK each year. Nearly 60 of these are children and young people. We believe that the majority of drownings are preventable.